A doctor joined Mari-san’s recital. He played the flute and the ukulele to the piano. Many kinds of music like classical , popular, children’s songs were played. 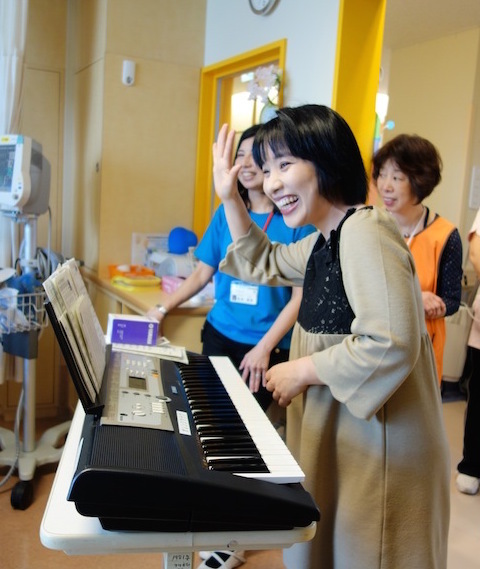 Mari-san played any kind of music that children and mothers liked and it made some children stop crying and enjoy her singing to her piano play. Some came out of their rooms to listen to the music played in other rooms. Voices of a vocal actress and narrators, sound effects of piano play make the atomosphere lively with so much presence. 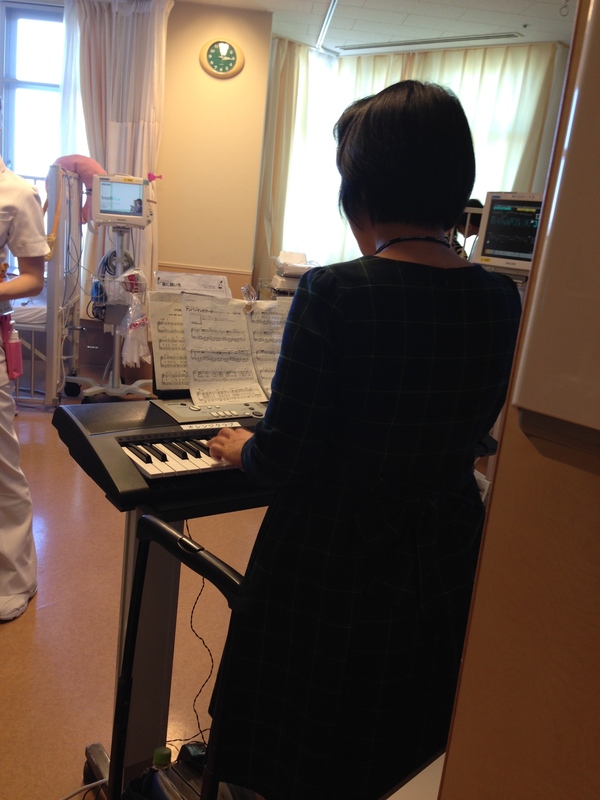 Professional performance is wonderful and it’s different from just story telling, one of the hospital staffs said. 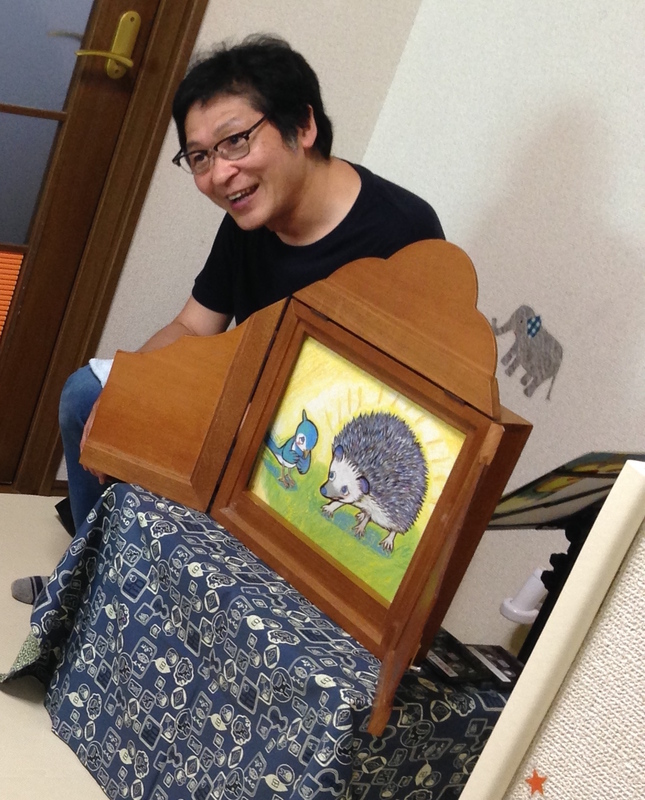 Kids all enjoyed Guy-san’s performance at each bedside. 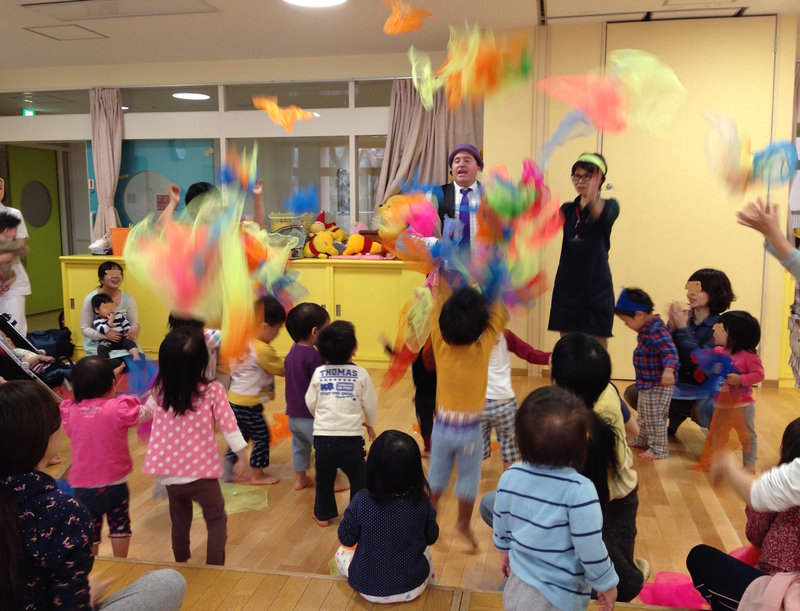 In the infant home, kids played with the colorful scarves throwing and catching after the show. 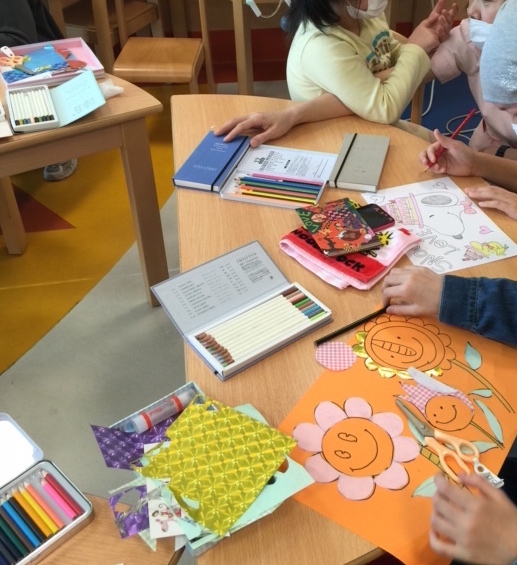 Children enjoyed tearing colored Japanese paper washi and making collage with those pieces. Feeling differece between just normal paper and washi like its touch and sound when they tore them as well as its unique texture, all finished their original work to put beside their bed. A mother came to the playroom to enjoy collage. She said she’d been looking forward to this workshop since the poster appeared on the wall of the playroom. This day, there held 2 more SHJ workshop. One in Kyoto Univesity Hospital. 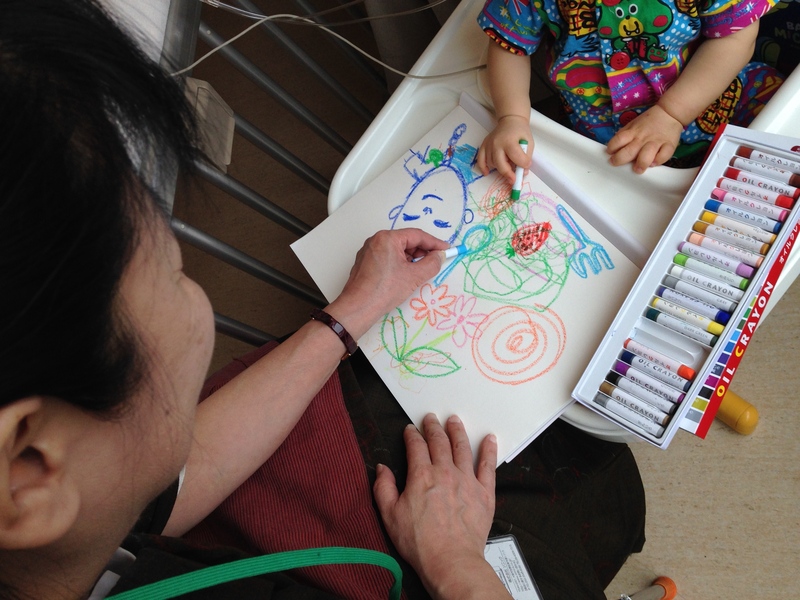 The other is the new place, Yodogawa Christian Hospital, Childen Hospice. 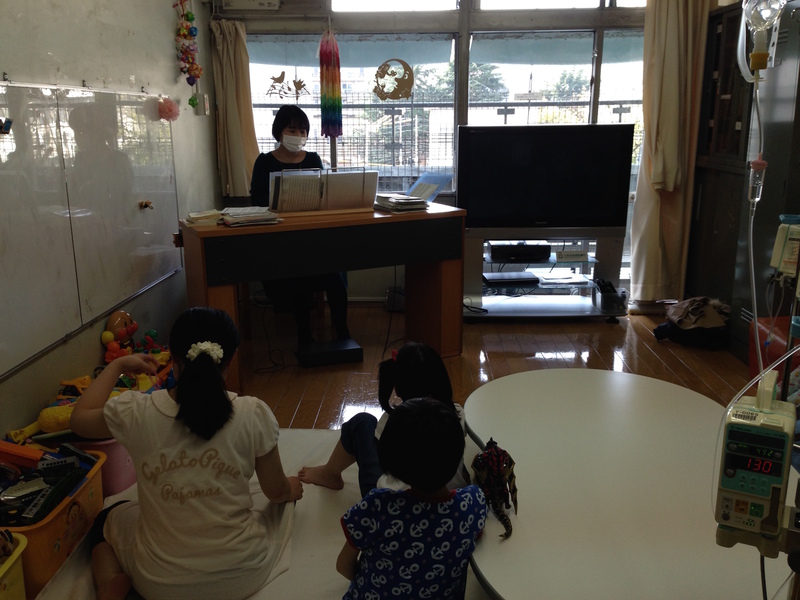 Everyone gathered in the playroom enjoyed listening and singing their favorite songs to the piano by Mari-san. 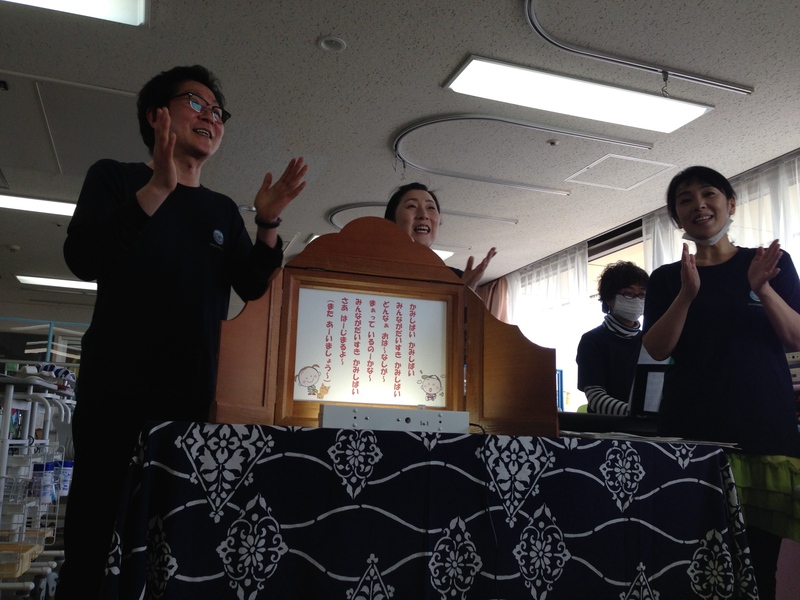 When a boy started dancing to the piano, doctors and nurses gathered and enjoyed watching his dancing. It made them smile and happy while being busys with their work. In the infant room, kids requested and enjoyed dysney songs, Ampamman and Doraemon. What song to order.., everyone doesn’t hesitate at all to ask Mari-san for playing and singing their favorite songs. This is because everyone knows that she never fails to do them favours. But when someone asks her to play the music she doesn’t know, he/she gives her homework to master it by next time. Again, Mari-san never fails to do her homework, which makes children happy. As it was the first visit by the picture writer Pulin-san, chidren seemed dubious at first but soon they got to like her tender atomosphere and quiet way of talking. 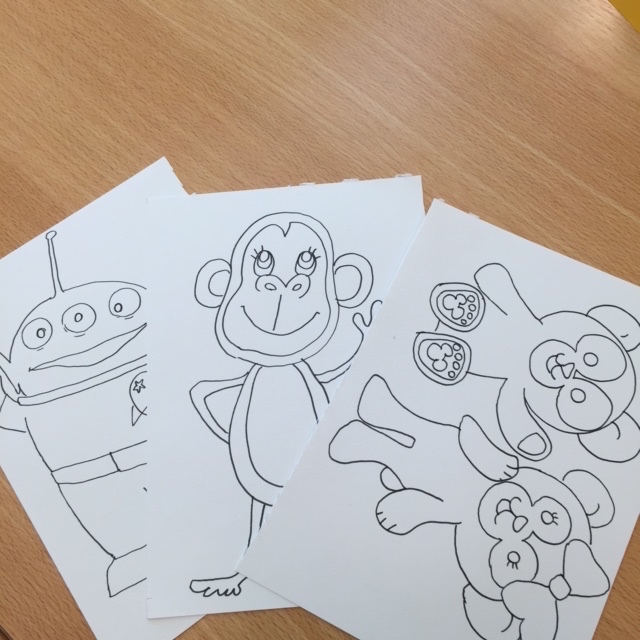 Some children enjoyed drawing with her. Others enjoyed being a model for a picure with his/her mother. Mari-san’s original coloring and collage is kids’ favorite. Kids are always satisfied with her perfect response to their request of drawing anime charactor for coloring, which gives her hard training like 1000 fungos!